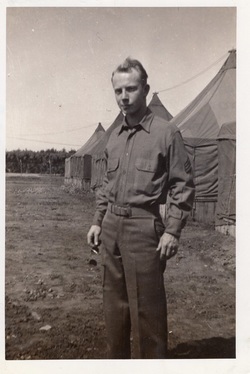 Warren Travis was twenty years old when he joined the Army. Nine months later was Pearl Harbor. Warren trained at Fort Bragg, North Carolina. His company was sent to Africa to fight Rommell. Hundreds of men were on a troopship. Most slept on deck on the way over. Warren served under Mark Clark. The battles were in the deserts of Africa. The soldiers walked behind tanks during the battles. Warren and his two brothers were in the service and the three came home and resumed their lives. In 1950 we were not married but saw the signs of Lakewood homes. We went to Lakewood Blvd. and saw the models. Right then we bought a house in the summer of 1950 and moved into the house in November. We were the third family on the block. Through the G.I. loan we were able to buy our home. We raised five children and my husband spent his retirement years here. So grateful that Lakewood is our home town. Many veterans used the G.I. loans. Warren Travis bought his house in Lakewood with the G.I. Loan in 1950.